It's late April 2014 and we are preparing for our trip through British Columbia, Yukon and into Alaska. During this upcoming trip, we expect to do a fair amount of dry camping (camping without hook-ups of any kind), therefore we decided to purchase a generator to give us more flexibility. 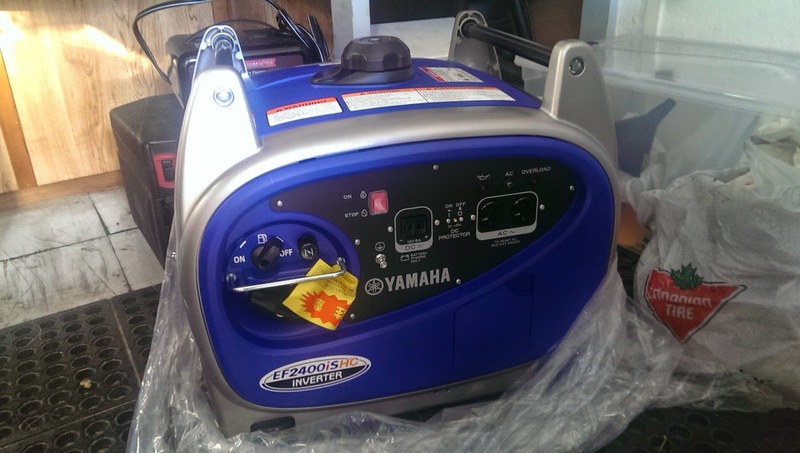 We bought a "EF Yamaha 2400 iSHC" , it will run the whole trailer including the AC if needed. 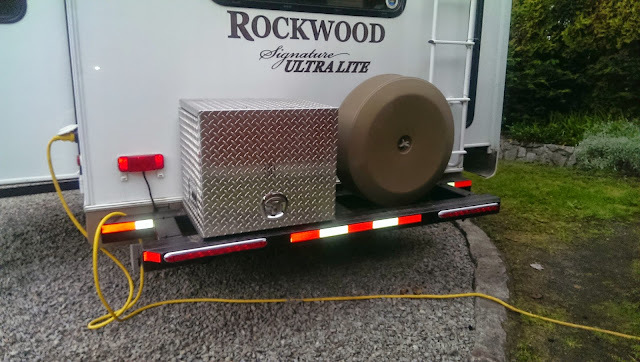 To house the generator we will have an aluminum box custom built and mounted on our rear bumper. We envision running the generator right in the box, so the box will be built with maximum airflow and ventilation in mind. 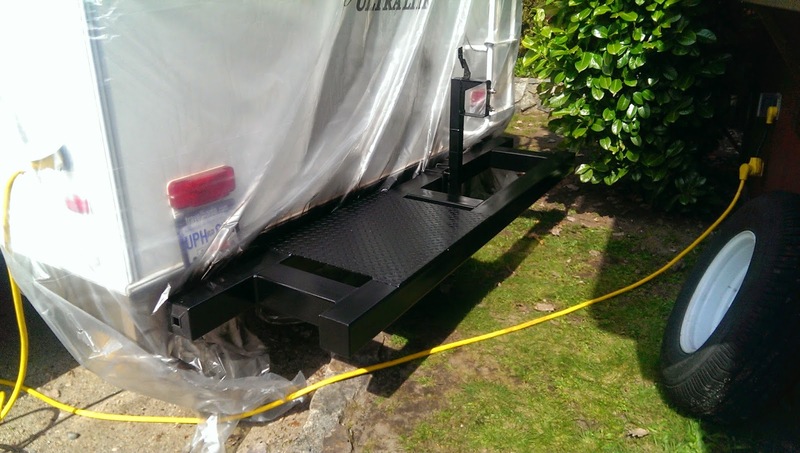 To accommodate the generator box we had to extend the bumper and also raise the spare tire rack. 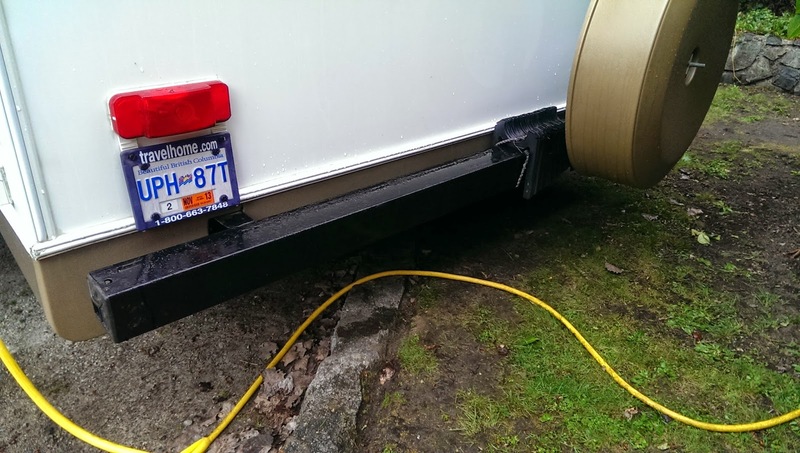 The work on the bumper we had done by CR Metal Manufacturing LTD in Campbell River and they did a fantastic job. 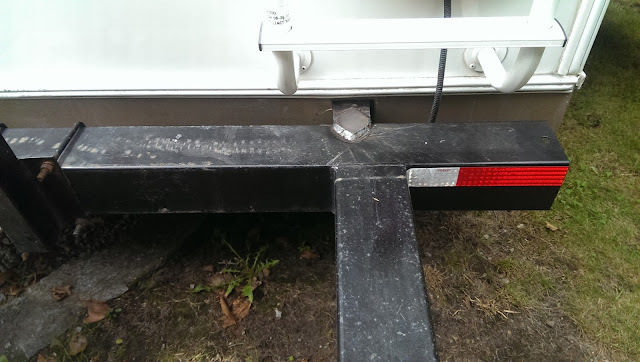 We decided to extend the bumper with 12 inches and then add a second bumper that will also serve as storage for a sewer hose extension. 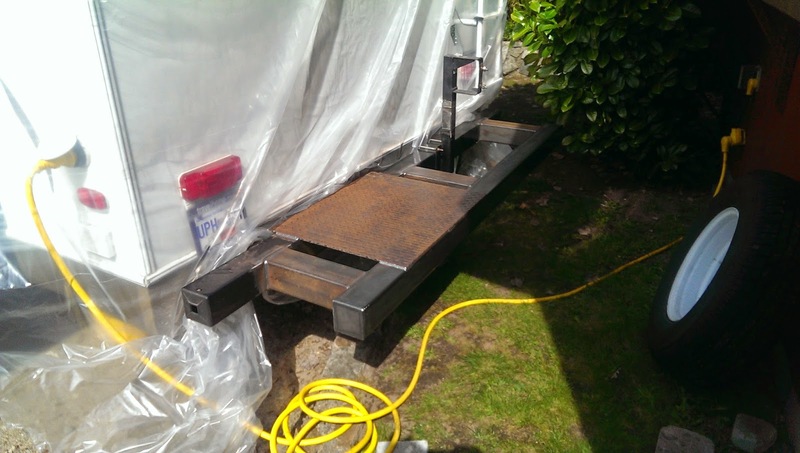 Further, we also had a 1/4 inch plate welded on, and that's where the generator box will sit. We designed the second bumper not as wide as the first. 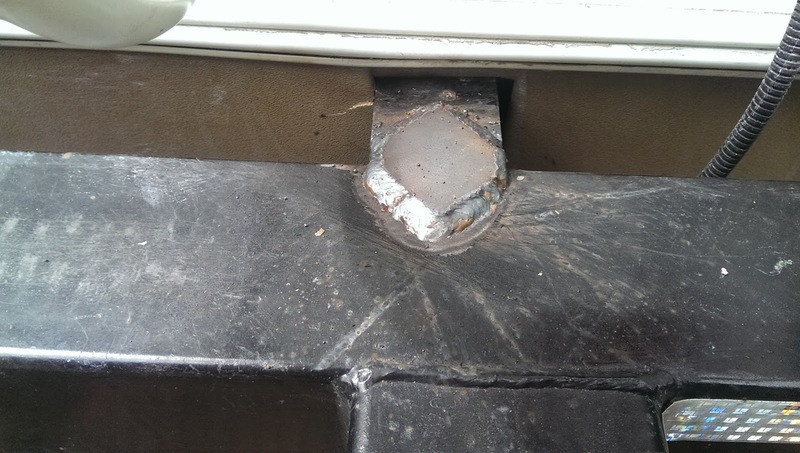 We recessed it 6 inches on each side. This way, when we make a turn in tight quarters, it will be less likely to hook on anything. Besides I think it looks better. The spare tire rack we had to make four inches taller. Before the spare tire was sticking out past the bumper. Now the second bumper will take the load should we back up into anything, or if someone should bump in to us. 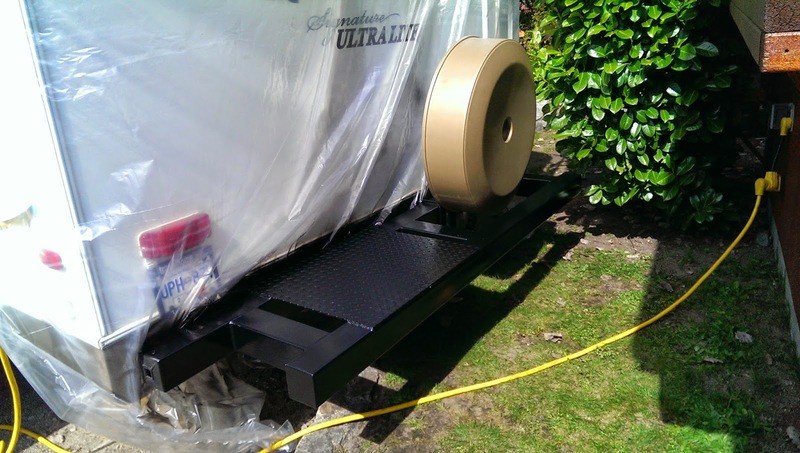 More on the generator box as it is being built. I have most of the design done. Scroll down for more pictures. Update, finished generator box click here. 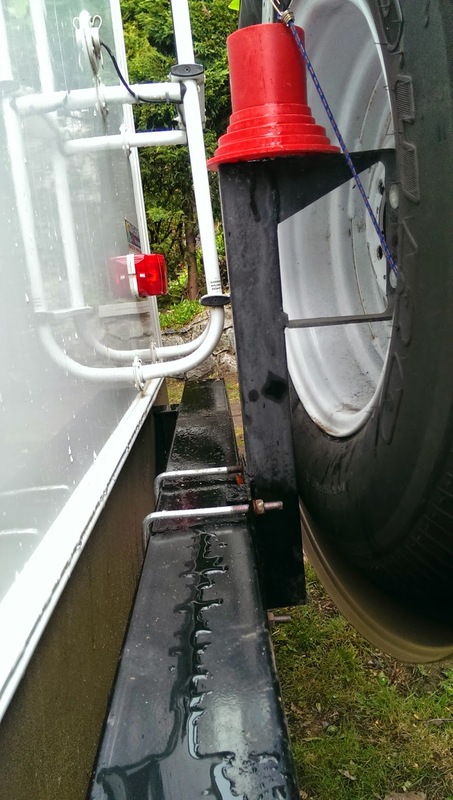 New extended spare tire bracket. Finished with spare tire in place. Added some light and reflective tape to the bumper. Update; Bumper Extension on our RV or Fifth Wheel Trailer October 2016. The extension of the bumper stood up well. We traveled from our home here in BC to Yukon and Alaska and back. Further we made a trip all the way down to the tip of Baja California and back. In total approximately 25,000 to 30,000 km. All this on some pretty rough roads. However the rough roads took it's toll on the bumper extension. I ended up doing some re-enforcing. See the pictures below. I would have to say, if I were to build one again, I would make a lot stronger then the first time. With the re-enforcement we have now it is very strong and should be just fine. 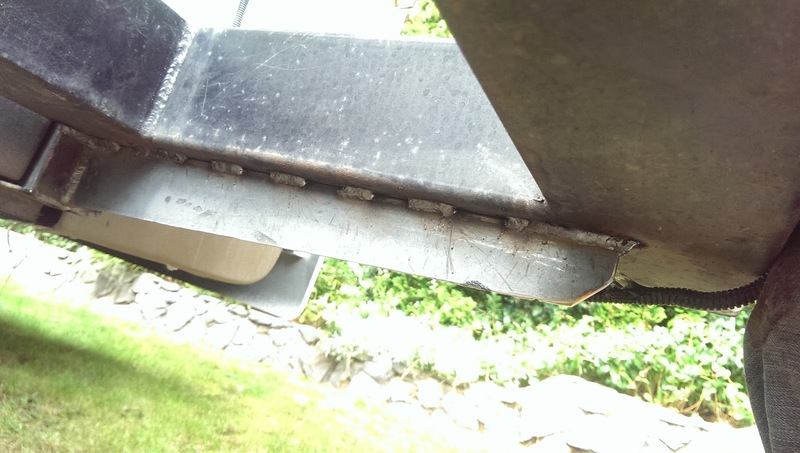 Diamond bracket welded on to the I-beam and the bumper for extra strength. 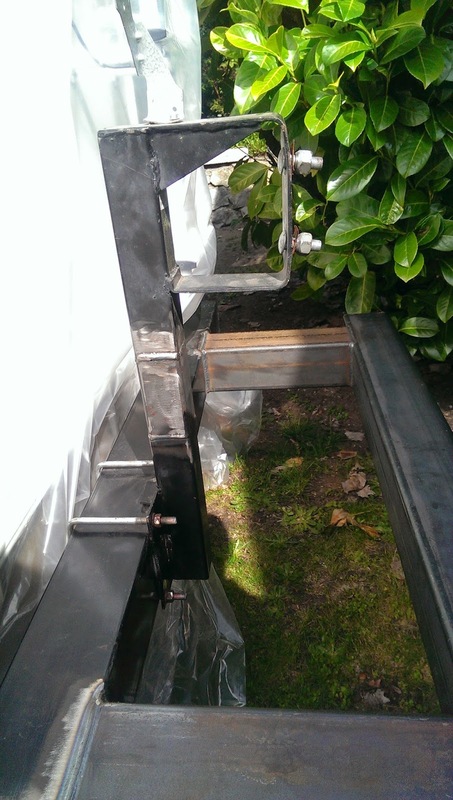 Close up of diamond bracket welded on to the I-beam and the bumper for extra strength.